The true origin of the Dalmatian is unknown, although it is believed to have originated in India. Paintings and figures of spotted dogs have been found in ruins as old as 5,000 years. Numerous written references to spotted dogs occur throughout history. The modern Dalmatian, notwithstanding his name however, was developed in Great Britain. While some Dalmatians were used for hunting, the breed’s primary purpose was as a coach dog. Coach dogs were by no means ornamental - they were there to guard the passengers and property in the coach. Because of their affinity for horses, it was natural for the Dalmatian to follow horse-drawn fire engines. Many fire departments are still graced by a Dalmatian mascot who guards the firehouse and helps educate children about fire safety. Dalmatians have been in this country since its founding, with George Washington being the most well known early breeder. 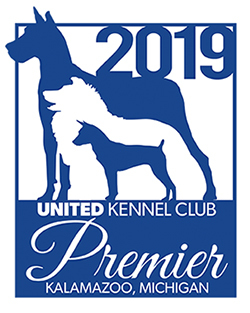 The Dalmatian was recognized by the United Kennel Club in 1914. The Dalmatian is a medium-sized, well-balanced and muscular dog, with a distinctively spotted short coat, high-set drop ears and a natural tail carried with a slight upward curve. The correct relationship of length of body to height at withers is 10:9, making the breed slightly longer than tall. The Dalmatian should be free of exaggeration or coarseness. It is capable of great endurance, combined with a fair amount of speed. Deviations from the described ideal should be penalized in direct proportion to the degree of the deviation. The Dalmatian is outgoing and friendly, never shy or hesitant. The breed should be free from any nervousness or aggression. The head is proportionate to the size of the dog and is free of loose skin. Viewed in profile, the top lines of the skull and muzzle lie in parallel planes. There is a moderate stop. The skull is almost flat, with a slight frontal furrow and well-defined temples. The skull is nearly as broad as it is long. The cheeks blend smoothly into a powerful muzzle that is about equal in length to the skull. Lips are clean and close fitting. The Dalmatian has a complete set of evenly spaced, white teeth meeting in a scissors bite. The nose leather is completely pigmented, black in black-spotted dogs, and brown in liver-spotted dogs. Serious Fault: Incomplete nose pigmentation. Set moderately well apart, somewhat round, medium size, bright and sparkling with an intelligent and alert expression. Color dark brown in black spotted, light brown to amber in liver spotted dogs. Eye rims completely black in the black spotted, and completely liver brown in the liver spotted dogs. Serious Faults: Functional abnormality of eyelids or eyelashes; incomplete pigmentation of the eye rims. The ears are drop, of moderate size, proportionately wide at the base and gradually tapering to a rounded tip. They are set rather high, are carried close to the head, and are thin and fine in texture. When the Dalmatian is alert, the top line of the ear is level with the top of the skull and the tip of the ear reaches to the bottom line of the cheek. The neck is fairly long, nicely arched, and blends smoothly into the shoulders. The neck is entirely free of throatiness. The shoulders are smoothly muscled and well laid back. The upper arm is approximately equal in length to the shoulder blade and joins it at an angle sufficient to insure that the foot falls under the center of the shoulder blade. The elbows are close to the body. The legs are straight, strong and sturdy with round bone. Pasterns are short and slightly sloping, with some spring. The Dalmatian is about as long, measured from prosternum to point of buttocks, as tall, measured from the withers to the ground. The line of the back inclines very slightly downward from the withers and then becomes level. The loin is short, muscular and slightly arched but narrower than the rib cage, and with a moderate tuck-up. The croup is nearly level with the back. Viewed from the front, the chest is deep, moderately wide, and well filled. The ribs are well sprung without being barrel shaped. Viewed from the side, the forechest is well visible and the brisket extends to or below the elbow. The hindquarters are rounded and powerful, with smooth, well-defined muscles. The legs are straight and parallel from hip to foot when viewed from behind. The second thigh is strong and there is good angulation at the stifle and hock joints. Good feet are an essential feature of this breed. The feet are round and compact with well-arched toes and thick, elastic pads. Toenails may be black or white in black-spotted dogs, and brown or white in liver-spotted dogs. Dewclaws may be removed. The tail is a natural extension of the topline. It is thicker at the base and tapers to the tip. It is carried with a slight upward curve but should never curl over the back. A tail of the correct length reaches to the hock. Faults: Tail set well below the topline; ring tail; vertical tail. The coat is short, dense, fine and close fitting. A correct Dalmatian coat is glossy and sleek. Severe Faults: Woolly or silky coat. Color and markings, and their overall appearance, are very important points to be evaluated. The ground color is pure white. In black-spotted dogs, the spots are dense black. 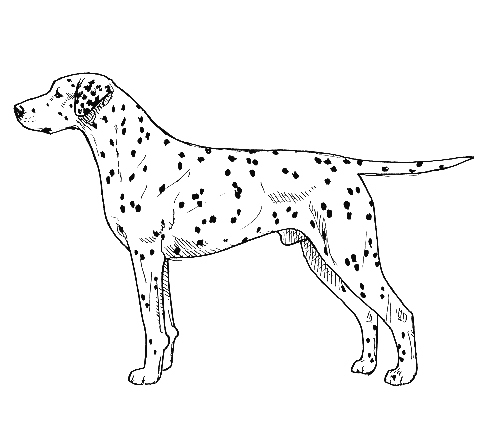 In liver-spotted dogs, the spots are liver brown. Spots are round and well-defined, the more distinct the better. Spots vary from the size of a dime to the size of a half-dollar. They are pleasingly and evenly distributed. The less the spots intermingle the better. Spots are usually smaller on the head, legs and tail than on the body. Ears are preferably spotted. Dalmatians are spotted dogs without large patches. Patches are a serious fault; they should be faulted in proportion to the degree that they vary from the ideal description of spots. Some limited patching around the eyes (monocle) and on or around ears is acceptable but not preferred. Serious Faults: Patches. Faulted in proportion to the degree that they vary from the ideal description of spots. Disqualifications: Any color markings other than black or liver. Tri-color. Lemon-colored spots. Albinism. The Dalmatian has good substance and is strong and sturdy in bone, but never coarse. Desirable height is between 19 and 23 inches measured at the withers. Eliminating Fault: Over 24 inches at the withers. In light of the Dalmatian’s historical use as a coach dog, correct movement and endurance are essential. Powerful drive from the rear combined with extended reach in front results in a steady, effortless trot. Elbows, hocks and feet turn neither in nor out. The topline remains level when gaiting. As the speed of the trot increases, there is a tendency to single track. Poor movement should be penalized to the degree to which it reduces the Dalmatians ability to perform the task it was bred to do. Eyes of two different colors. Over 24 inches at the withers.